The Canada Revenue Agency’s (“CRA”) Audit, Objection, Appeals and Collection Departments are separate, but related, departments. The nature of our tax dispute and tax litigation practice requires that we simultaneously manage some or all of these departments. In most cases, it is imperative that we prudently manage the CRA Collection Department while we work to reduce your alleged tax debt. This way, our clients’ financial affairs are protected. We believe that it is important that our clients appreciate the CRA’s ability to collect alleged tax debts. We hope that this overview will provide our clients with a foundation to make better decisions and provide our firm with informed instructions. We recommend that our clients read the following comments and call our firm to discuss how this information applies to their specific factual or legal circumstances. 1. Your decision to pay, or not pay, an amount in dispute will not impact the success or failure of your dispute. A decision to pay an amount in dispute does not indicate that you believe that the CRA’s position is correct. It is not an admission of any guilt. 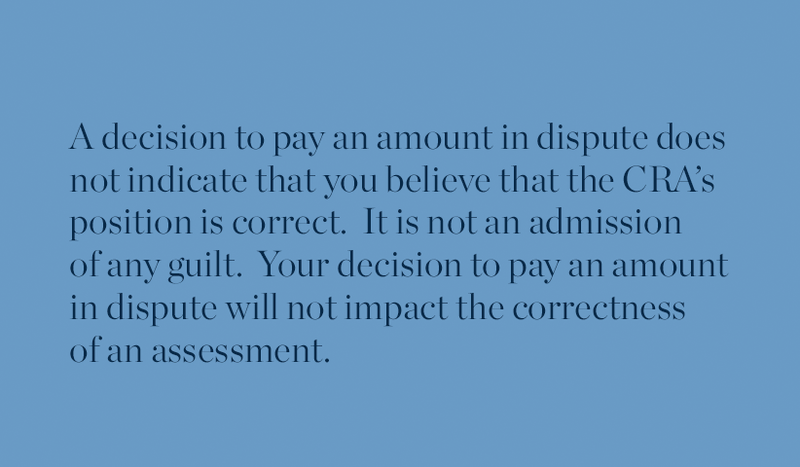 Your decision to pay an amount in dispute will not impact the correctness of an assessment. 2. Section 225.1 of the ITA & the restrictions on the CRA’s ability to collect. The Income Tax Act (“ITA”) and Excise Tax Act (“ETA”) govern the CRA’s ability to collect income tax debts and HST debts, respectively. Section 225.1 of the ITA restricts the CRA’s ability to take collection action against a taxpayer that has objected or appealed an assessment in some cases. For example, the CRA cannot take legal action to compel a taxpayer to pay a personal income tax debt or the federal portion of a corporate tax debt if the amount is in dispute. The ITA does contain exceptions to section 225.1 of the ITA. First, applications for taxpayer relief do not constitute “objections or appeals” and, therefore, section 225.1 does not restrict the CRA’s ability to collect on the basis that a taxpayer filed an application for taxpayer relief. Second, section 225.2 of the ITA provides that the CRA may request that the Federal Court, or a superior court of the applicable province, lift the collection restriction in section 225.1 if the CRA can establish that a delay would put collection at risk (the “Jeopardy Provisions”). Although the CRA attempts to use the Jeopardy Provisions and taxpayers can defend against these applications, anecdotal evidence suggests that the number of CRA applications under the Jeopardy Provisions is increasing. Third, section 225.1 of the ITA does not limit the CRA’s ability to collect other types of tax debts including, but not limited to, source deduction debts, and the provincial portion of corporate tax debts. The ETA does not have a provision that mirrors section 225.1 of the ITA and, therefore, the CRA is never restricted from collecting HST debts. 3. CRA interest accrues on unpaid tax debts. As discussed, section 225.1 of the ITA may provide you with an opportunity to defer payment of an amount in dispute. The CRA will charge interest on tax and penalties starting from the day that the subject tax return was due. The CRA interest will continue to accrue until the debt is paid in full or the debt is vacated. For example, if the CRA issues a notice of reassessment, dated May 18, 2013, increasing tax and penalties payable related to the 2010 taxation year, interest will continue to accrue on any outstanding amount at the end of the dispute and – if the amount in dispute is not vacated in whole – you will be liable to pay the amount in dispute plus the interest that accrued on the remaining amount while the debt was in dispute. 4. The CRA’s prescribed interest rate is very high. The CRA’s prescribed interest is compounded daily in accordance with the ITA and ETA. The CRA’s current prescribed interest rate is five per cent i.e., the CRA’s rate is four per cent higher than the Bank of Canada’s current average rate. For example, a $50,000 tax debt outstanding for the period starting April 30, 2010 to May 18, 2013, will accrue approximately $8,234 of CRA interest. Simply put, money is cheaper almost everywhere else. 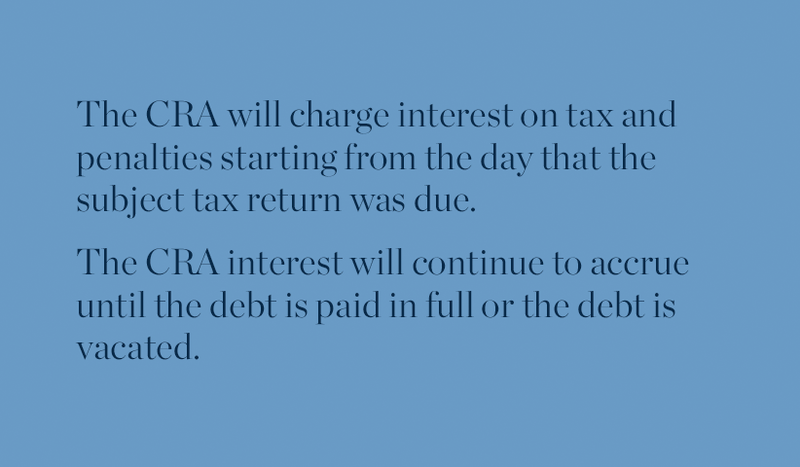 The CRA’s interest is not deductible. 5. The CRA will pay refund interest. The CRA will pay refund interest if you pay the amount in dispute and the debt is subsequently reduced in whole or in part. At the time of writing, the refund interest paid three per cent for individuals and one per cent for corporations. The CRA’s refund interest is taxable on receipt. 6. Transferring assets to a non-arm’s length parties for less than fair market value in an attempt to defeat the CRA’s ability to collect is a bad idea. 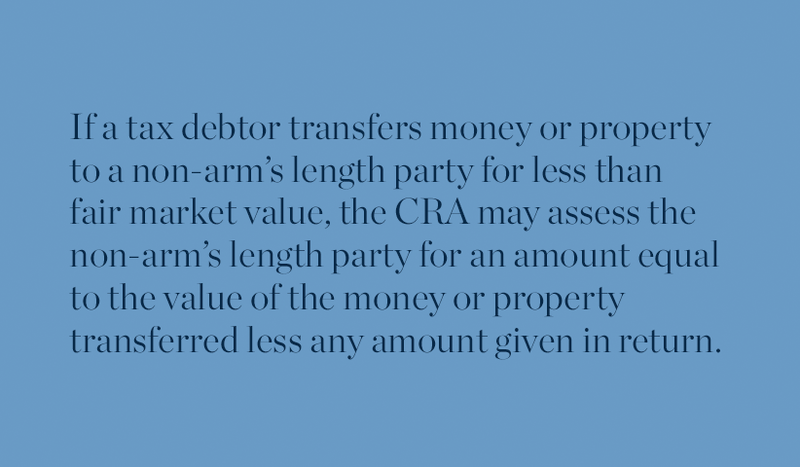 If a tax debtor transfers money or property to a non-arm’s length party for less than fair market value, the CRA may assess the non-arm’s length party for an amount equal to the value of the money or property transferred less any amount given in return, pursuant to section 160 of the ITA and section 325 of the ETA. Moreover, it is irrelevant whether the parties intended to defeat the tax debt, it is irrelevant whether the parties had knowledge of the tax debt, and there is no time limit on these types of assessments. A common section 160 application is where a spouse (the “transferor”) transfers his interest in the family home to the other spouse (the “transferee”), leaving the transferor with no assets for the CRA to seize. In these circumstances, the CRA may attempt to use section 160 to assess the transferee for an amount equal to the lesser of the value of the one-half interest in the family home and the transferor’s tax debt. 7. 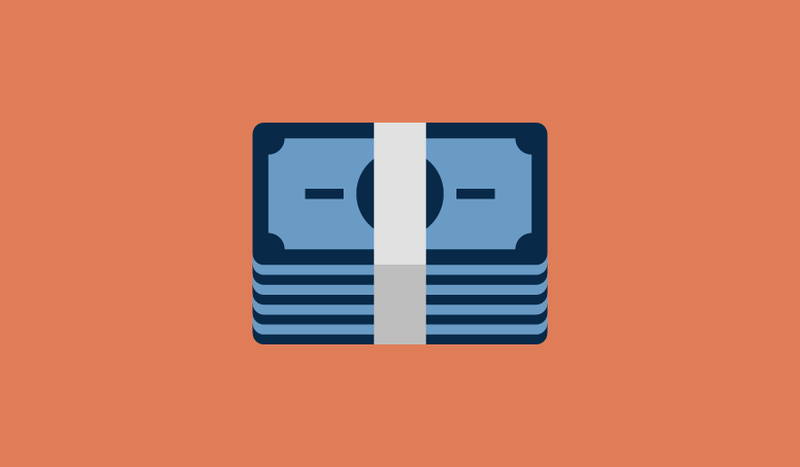 Paying an amount in dispute can reduce your legal fees. If the CRA’s ability to collect is not restricted, the CRA Collection Department will call our firm to demand payment, demand financial information (e.g., account receivable listings), and threaten collection action. We regularly negotiate payment arrangements with the CRA and protect our clients’ interests. However, negotiating payment arrangements and defending against demands for information (especially if the CRA’s ability to collect is not restricted and the law is not on our side) is difficult, time consuming, and frustrating. In addition, negotiating payment arrangements with the CRA Collection Department is not our favourite pastime and we believe that our legal expertise can be put to better use. We would prefer to focus our attention – and our clients’ resources – on defeating the underlying assessment.